Winterlicious was upon us and I couldn't miss out! On the second last day, my Chef Aunt and I headed to Fabbrica. She said that as a chef, Winter/Summerlicious is the only time when food professionals really get to see what everyone else is up to. She looks forward to it! We had scoped out the menu ahead of time, so we were ready. 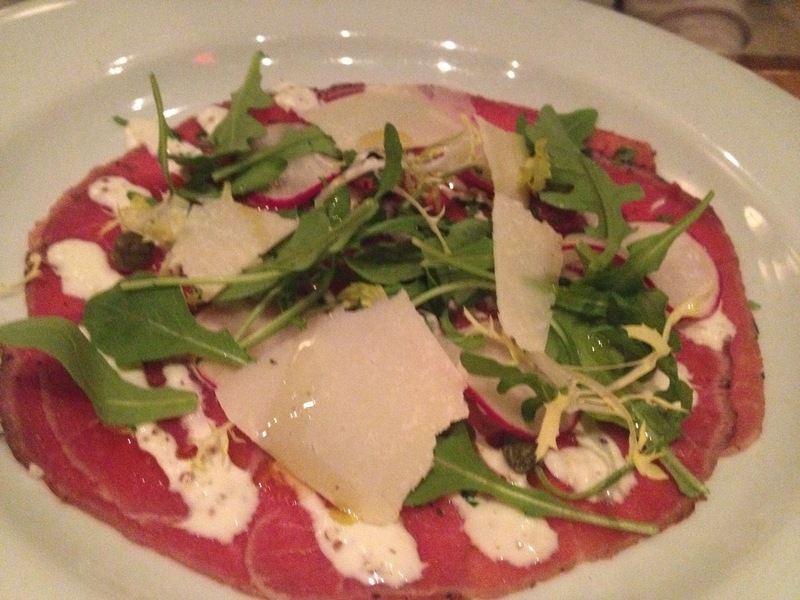 She selected the Beef Carpaccio and I went with the Sicilian Garlic Soup. She said she didn't like radish until that dish. She could tell the meat was made in house; what a treat! 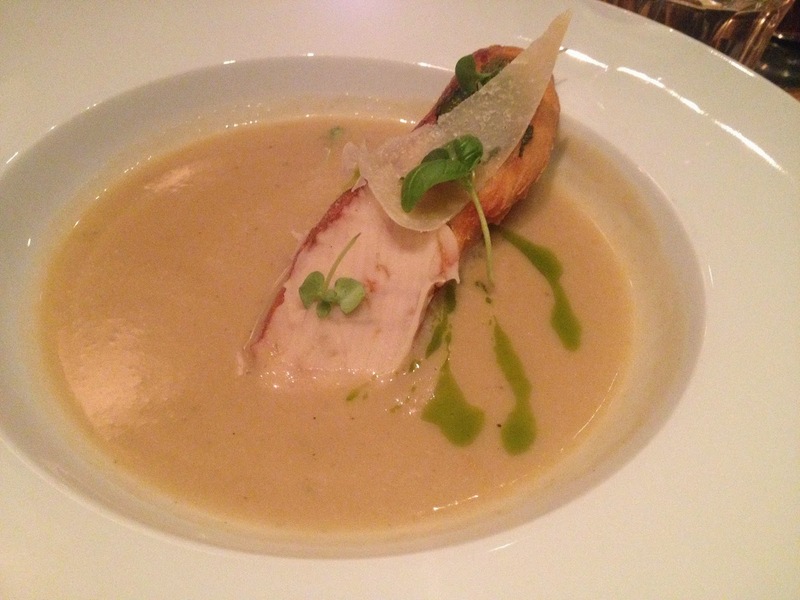 I was worried that I would reek of garlic after having the soup, but my Aunt said it was roasted garlic. I had no idea that roasted garlic didn't give you garlic breath! Win! I was definitely worried about wilting plants. The garlic wasn't over-powering and the texture was fantastic. Time for the main course! Chef Aunt chose the Parpardelle and I went with the Grilled Shrimp. Now THAT is a ragu! 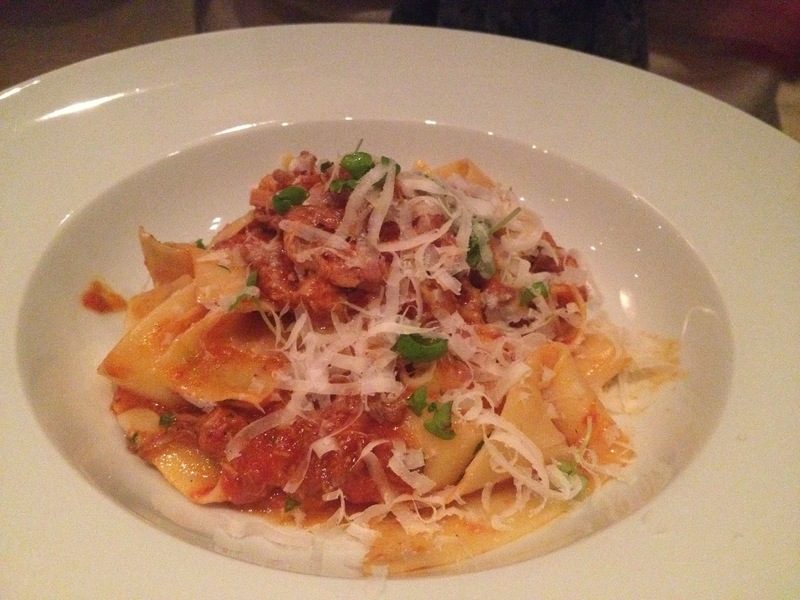 The parpardelle ragu perfectly balanced the acidity of the tomatoes and the savoury flavours of the spices. Again, that homemade feel makes it even better. And the freshly shaved parmigiano reggiano brought it full circle. 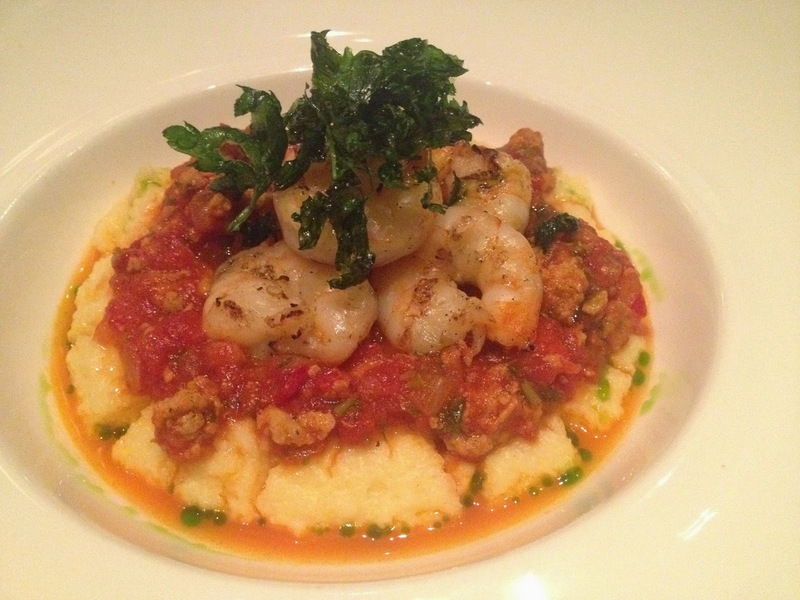 I'm a sucker for polenta, so when I saw the Grilled Shrimp came with polenta, I was sold. The shrimp in the sweet pepper/chili sauce with sausage was a fantastic mix. The warm, creamy polenta was like a warm blanket on a cold day. Made in-house, it mellowed the pepper and chili nicely. Two perfect dishes for a cold, snowy night. But...there's always room for dessert! Being a chocoholic, I chose the Chocolate Torta. 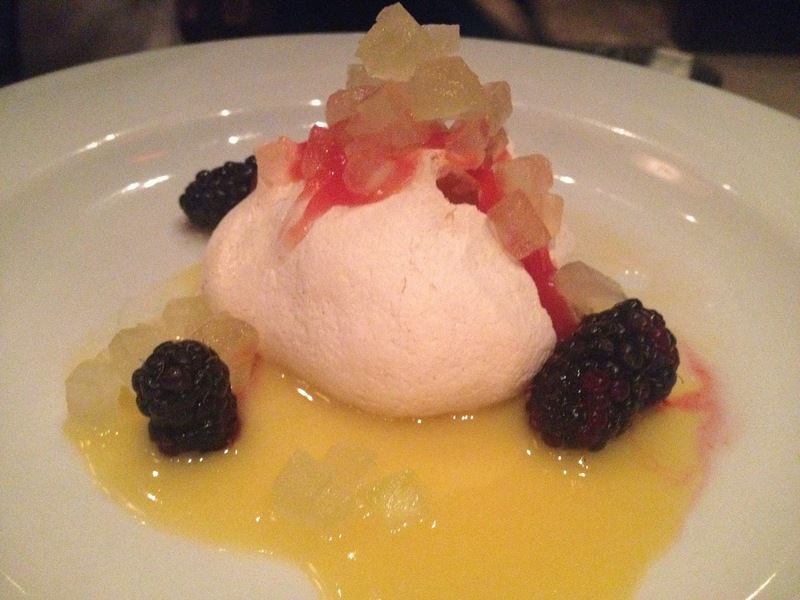 My Chef Aunt, sticking with the theme of food I can't pronounce, went with the Pavlova di Fabbrica. The torta was heavy and rich. 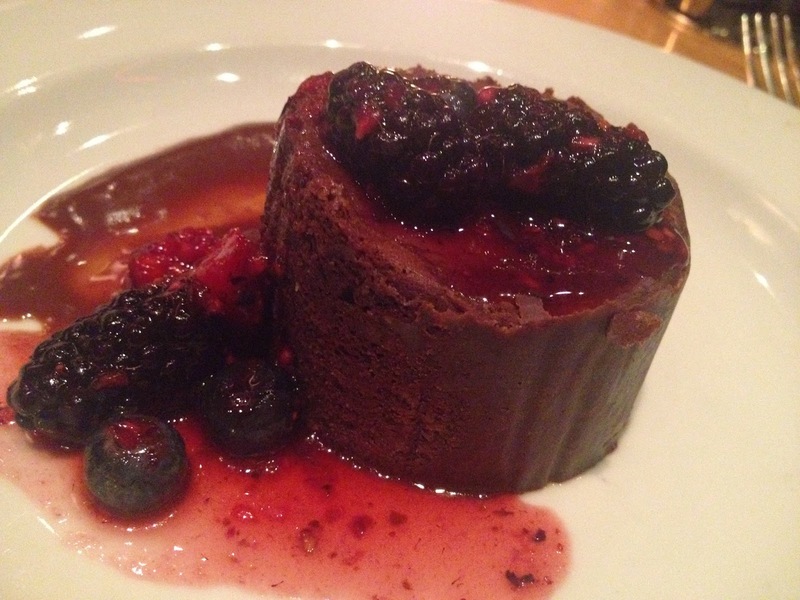 It really needed the berry compote to soften the richness. Now to the pavlova. I've never heard of it before and my Aunt insisted I try a bite. It was like tasting sunshine. The softness of the meringue, the sweet and citrus of the grapefruit and blood orange, the tartness of the blackberries....just wow. As a chocoholic, I would choose this over chocolate. It was that good. So refreshing! A must have! Was the food good? Yes. Was the service good? No, it was great! Our server was fantastic. He was attentive, kept the water classes full and didn't make us wait forever between courses. He claimed he made a mean cappuccino....he was right! All of the staff there were polite and seemed happy to be there; they were quick, but not in a hurry. The table beside is sounded like regulars; they were telling their friends about their favourite dishes, so this place is not a one trick pony. From the food to the service; this was a solid performance.